A convicted Mafia boss who had been hiding in west London for 20 years has told an extradition hearing "I want to cut every tie with my past". Domenico Rancadore, 64, was arrested in Uxbridge in August where he was living with his wife and two children under the assumed name of Marc Skinner. 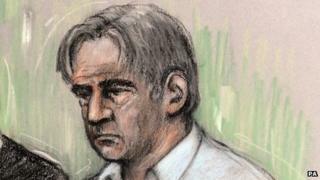 Westminster Magistrates' Court heard he wanted "a normal life" for his family. The hearing was also told Rancadore, who was known as The Professor in his native Sicily, suffered from the heart condition angina. Since taking refuge the UK in 1994, Rancadore and his family used the surname of Skinner, the maiden name of his wife's British mother. Giving evidence, Rancadore explained why he had used a different name, saying: "I change my name, I change my life, I don't want to go back to Italy." Referring to his stay in the UK he said: "I never commit any crime in this country. I love this country." He said there were 460 defendants in the trial in Italy in which he was a defendant along with his father in the 1980s, and he described it as a "terrible experience". Talking about his angina, he said: "I'm not very well. I feel destroyed. I feel very painful." But prosecutor Hannah Hinton said Rancadore was "deliberately absent" from the 1999 trial, where he was subsequently sentenced, and had deliberately "hidden" his identity as he knew he was a wanted man and had changed his story. Ms Hinton said: "What I'm going to suggest, Mr Rancadore, is that when you came to this country, that you were worried, concerned, that you were going to be arrested again and now you accept that. "But previously what you were telling the court was that you only came here to make a new life for yourself, having collected your pension," she said. Rancadore was also questioned as to why his signature was on a document instructing two lawyers to challenge an Italian judgment by appeal - implying that he knew he was wanted by police. But Rancadore said it was not his signature and had not been in contact with lawyers or with his parents. "I never gave my address to anyone in Italy. I never contacted anyone in Italy," he said. Ms Hinton suggested Rancadore was aware when the trial began and also came to know about the sentence, but he claimed to have learnt about the sentence after his arrest in the UK. Rancadore's wife, Anne, told the court the extradition would be "devastating" for her husband. "If my husband was to go to Italy it would be difficult for me to visit him," she said. "It would really be devastating for me and for family life as well." She also said her husband's father was a Sicilian Mafia leader and her son would have been hassled by police if they had remained in Italy, forcing them to leave. The judge also heard from law professor and Italian prison expert Patrizio Gonnella who said: "Italy has the highest rate of crowded prisons in the whole of Europe. "Today the matter of safeguarding of health is the biggest, the most critical, issue in our prisons."